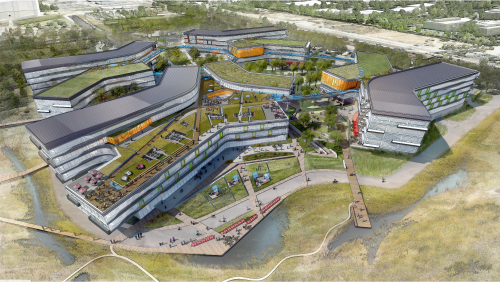 Last week, Google released an architectural rendering of its next headquarters: a 1.1 million square-foot corporate campus located across town from the existing "Googleplex" in Mountain View, California. You can zoom and explore the high-resolution rendering here. In the architect's imagination, the forthcoming "Bay View" complex will provide ample ways to exercise, such as rooftop scooter-riding, jogging, biking, and yoga class. There will also be a perfect space for reflecting on the meaning of existence. And employees who never want to leave can pitch a tent and stay the night.